Good morning and welcome back to Generate! Today's music birthdays include Fugees co-founder Pras, so let's listen to this as we get to the news. Here we go . . . Record-breaking: The Energy Information Administration issued a report yesterday that shows exports of crude oil and refined petroleum products reached record levels in the first half of 2017. 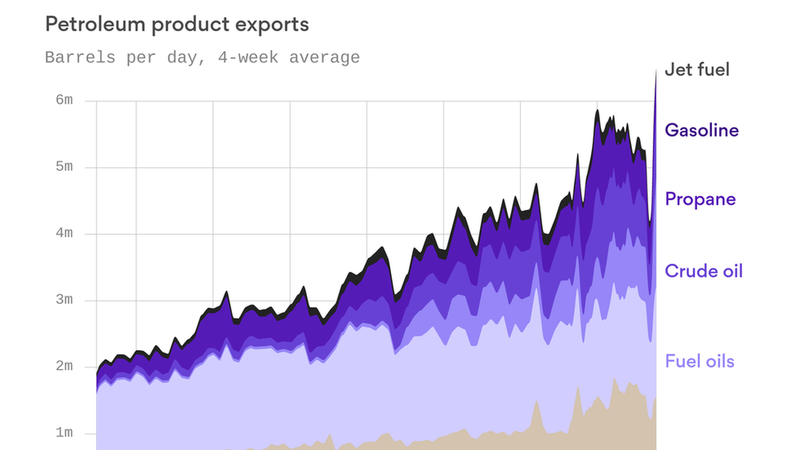 And check out the chart above — Chris Canipe, one of the Axios data visuals wizards, looks at even more recent data to show how the trend has largely continued. Why it matters: The data signals how the U.S. has become a major player in global petroleum markets. The expansion of crude oil exports is especially noteworthy — the lifting of the crude export ban in late 2015 combined with the shale oil surge has enabled a major rise in U.S. crude shipments. The gritty details: Crude oil exports, which grew by 300,000 barrels per day to 900,000 bpd in the first half of the year compared with the same period in 2016, have really taken off in recent weeks, fueled in part by the size of the discount of WTI compared with Brent crude. Other EIA data released yesterday shows exports of 1.8 million barrels per day in the week ending Oct. 13, which is up from the 1.3 million the prior week. It's not quite the nearly 2 million in late September when refinery outages from Hurricane Harvey was pushing excess supply of discounted crude into the arms of willing global buyers. One key line: "There is no peak oil demand for the foreseeable future." Projection: Barkindo says that the cartel's upcoming World Oil Outlook 2017 report next month will project global demand to pass 100 million barrels per day in 2020 and surpass 111 million barrels by 2040. More: Reuters puts some context around his comments about efforts to rebalance the oil market. "Big oil company executives asserted that fossil fuels would remain the central part of their business for decades, despite recent investments in renewables and other energy sources made in response to efforts to curb carbon emissions," they report. More context: The remarks "represented a defense of the industry's traditional work at a time of growing pressure from investors and activists to manage their risks related to climate change," the WSJ piece states. Statoil: This Wood Mackenzie podcast looks at the future of the Norwegian oil-and-gas (and increasingly renewables) giant. One takeaway: Nearly 40% of its oil-and-gas production in 2026 is slated to come from projects that are not yet under development, the highest proportion among the majors. The company is slated to make final investment decisions on six big projects by the end of 2018. BP: CEO Bob Dudley, speaking at the big London energy conference yesterday, said the company has repositioned its approach to green energy projects. "We're making smarter, and in many cases, smaller bets, and making more of them across a wider range of technologies and business models," he said. Reuters has more on Dudley's remarks here. Exxon: The company said yesterday that it has bought a terminal in the west Texas town of Wink to help accommodate its growing Permian Basin output. "The terminal is strategically positioned to handle Permian Basin crude oil and condensate for transport to Gulf Coast refineries and marine export terminals," the company said. The Houston Chronicle has more here. New data: The first nine months of 2017 are the second-warmest in records that date back to the late 1800s, according to the latest monthly National Oceanic and Atmospheric Administration report Wednesday. Why it matters: The data underscore how this year is part of a long-term warming trend that scientists say is largely due to human influences. The gritty details: The January-September period was 0.87°C (1.57°F) above the 20th-century average. "Nine of the 10 warmest January-September global land and ocean temperatures occurred during the 21st century (since 2005), with only one year from the 20th century (1998) among the top 10. Based on three simple scenarios, 2017 will likely end up among the top three warmest years on record," NOAA said. Biofuels: Via Bloomberg, "President Donald Trump intervened personally with the Environmental Protection Agency amid pressure from Republicans in the politically important state of Iowa who worried the agency was poised to weaken biofuel quotas, three people familiar with the discussions said." Arctic drilling: As the Senate moves into the budget amendment voting frenzy, look for Democrats to float their amendment to cut provisions that would enable future, filibuster-proof legislation to open the Arctic National Wildlife Refuge to oil drilling. Why it matters: The amendment is unlikely to succeed, but the wider uncertainty over the budget process obviously means this is hardly a sure thing despite unified GOP control of Washington. That said, Republicans are closer to opening ANWR than they have been in slightly over a decade. Yes, but: The oil industry's interest in expensive Arctic projects is uncertain these days amid modest prices and ample opportunities in the shale patch and elsewhere. And the long leasing, development (and litigation) timeframes mean that a Democratic administration could thwart development if Trump loses in 2020. Democratic Sen. Heidi Heitkamp filed an amendment on carbon capture and storage that, if voted on, will amount to a test vote on the appetite for bipartisan proposals to expand tax credits for carbon capture projects. Democratic Sen. Jeff Merkley floated a messaging amendment that would create hurdles to Senate consideration of bills that "provide greater net benefits for fossil fuels than for renewable energy sources." Republican Sen. Jeff Flake has a measure aimed at "simplifying the tax code and leveling the playing field by eliminating all energy tax credits." Ron Wyden, the top Democrat on the Senate Finance Committee, has an amendment in support of "long-term, technology-neutral tax incentives for clean energy." FERC battle: Greentech Media has a piece that explores what members of the Federal Energy Regulatory Commission have said so far about Energy secretary Rick Perry's controversial proposal to boost compensation for coal and nuclear plants in some power markets. "Comments from the FERC's newly minted quorum indicate that Perry's proposal to compensate coal and nuclear plants for stockpiling 90 days of fuel won't glide through the commission," they report. Power markets: The latest episode of Grid Geeks demystifies the quasi-governmental regional transmission organizations that play a key role in power market oversight, and gets into proposals to enable new market entrants and other stakeholders to have a greater voice. Energy storage: The latest episode of More Power To You looks at the growing and evolving market for energy storage at the utility and residential scale. And stick around until the end for the discussion about how the rise of electric vehicles could intersect with the grid. Clean Power Plan: A recent episode of Trump on Earth features an interview with Bracewell partner Jeff Holmstead, a senior EPA official under George W. Bush, about the new proposal to repeal EPA's carbon emissions rule for power plants, and what might replace it.